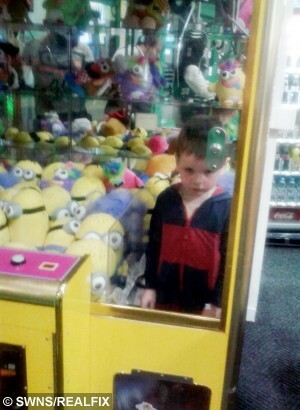 Little Henry Howes got stuck inside an arcade claw machine after climbing in when he failed to win a Minion teddy. 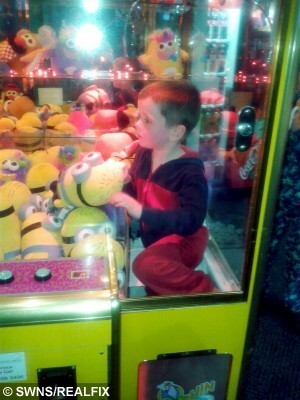 Determined Henry, four, asked mum Emma for £1 to have a go on the arcade game at his local swimming pool. The claw picked up a Despicable Me toy but then agonisingl y dropped it just short of the delivery chute. Henry refused to give up and put his hand inside the hatch in a bid to grab the Minion teddy, but reached too far. His bottom slipped under the trap door on the front of the machine, trapping him inside. 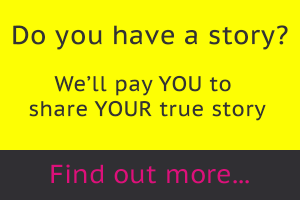 The drama was witnessed by older brother Harvey, nine, who ran to get their mum. She saw the funny side and called staff at the Snowdome in Tamworth, Staffs., who then spent half an hour looking for the keys to free Henry. Mum-of-three Emma, 33, said: “He asked if he could have a go on the teddy machine so I gave him a #1 and told him to go with his big brother. “He had picked the teddy up with the claw and it had dropped with the teddy’s leg hanging over the edge. She added: “I don’t know how he managed to get in there. He’s only four but he’s a tall lad. “I was laughing my head off. I could see that he was fine and he wasn’t upset. “I had to go to the reception and tell them my son was stuck in the machine. They couldn’t believe it either. Pre-school Henry had just been for his swimming lesson with Harvey and was waiting for sister Scarlett, seven, to finish her class when he got stuck. Staff went off to find the keys to let him out while Emma tried to get him to reach up to the screws to a side hatch. But he wasn’t tall enough reach – and wouldn’t let go of his cuddly toy – and was unable to open the hatch door from the inside. Emma, a caterer from Tamworth, said: “They tried to take one side off but they couldn’t find the keys. “We were asking him to reach up and get at the screws but he wouldn’t let go of the teddy. Emma, married to Don, 34, added: “When I showed his dad he laughed too. He said it was the kind of thing he would have done when he was young. Henry’s adventure ended happily as he went home with the teddy when staff allowed him to keep it. Emma said: “I said to the lady ‘I hope you’ll let him have it’ and they did.